The city of Prague can be reached by various means of transport: by plane, train, coach, car, or even by boat. Prague Public transport is a convenient, comfortable and fairly cheap way of travelling around the city. 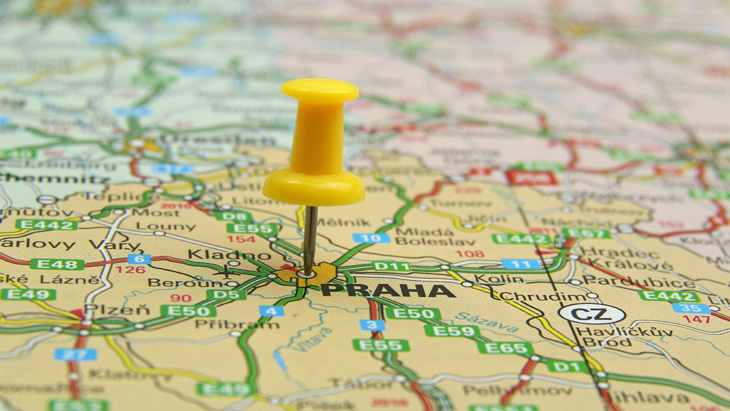 If you decide to travel to Prague by car, you’ll find that Prague is the hub of the Czech network of highways with the roads extending in all directions. On the one hand it ensures a good standard of travel, on the other it can cause traffic jams during rush hours. Thus, before you set on a journey, check the current traffic situation at kamery.praha.eu. Parking in the city center may be hard as most parking spots are allocated to the residents. Leave your car in one of the P + R car parks and take the public transport, or use one of the large car parks located by the Main Train Station, on Florenc, under the National Theater, on Lesser Square, Na Františku, under the shopping mall Kotva, under Rudolfinum, on Aleš Embankment, or on Opletalova Street. For railroad travel there are two international train stations in Prague - Main Station in the vicinity of Wenceslas Square and Holešovice Station. Both are connected with the city center by public transport, located on the metro line C.
If you want to travel by coach, the most important bus station is Florenc located in the city center and to be found above the interchange station of the metro lines B and C. Regular coach lines travel to all important destinations inside and outside of the EU. Václav Havel Airport Prague, Ruzyně is a flight hub used by more than 40 airlines that travel to hundreds of destinations. There are three passenger terminals: Terminal 1 is used to flights outside the Schengen zone, Terminal 2 within the Schengen zone and Terminal 3 is for private and charter flights. For updated information call non-stop phone lines +420 220 113 314 and +420 220 113 321. Located about 10km from the city center it can be easily reached by metro lines A or B and involves taking the barrier-free bus n. 119, 100 or 179. After midnight when the metro is closed, there is a night bus number 510 that runs with 30 minute intervals to and from the airport. For more information visit the website of Prague Public Transit Co., where you will find tariffs and timetables.